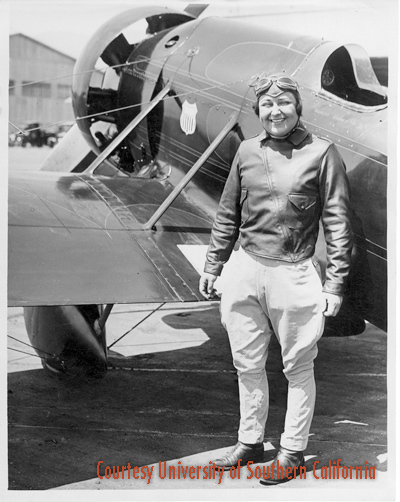 The Legend of Pancho Barnes - A Documentary Film , Florence "Pancho" Barnes was one of the most important women in 20th Century aviation. A tough and fearless aviatrix, Pancho was a rival of Amelia Earhart's who made a name for herself as Hollywood's first female stunt pilot. Just before WWII she opened a ranch near Edwards Air Force Base that became a famous -- some would say notorious -- hangout for test pilots and movie stars. Known as the "Happy Bottom Riding Club", it became the epicenter of the aviation world during the early jet age. Chuck Yeager celebrated breaking the sound barrier there in 1947, and Howard Hughes and Jimmy Doolittle caroused in the bar. The Club's destruction by fire in 1953 is seen by many to mark the end of a Golden Era in post-WWII aviation. In the same fashion Pancho herself has become something of a legend, a fascinating yet enigmatic icon whose swagger is often celebrated, but whose story has been largely unknown. Until now. Own "The Legend" on DVD! 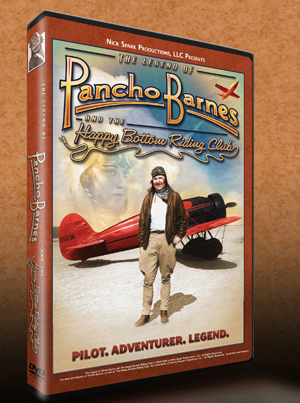 The DVD of The Legend of Pancho Barnes and the Happy Bottom Riding Club featuring BOTH the broadcast and "uncensored" versions of the film is now available through Amazon.com. To purchase, simply click HERE. 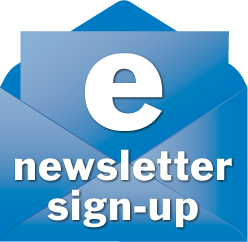 Or to order by phone call our friends at the EAA at 1.800.564.6322 (outside USA 920.426.6761). The Legend of Pancho Barnes and the Happy Bottom Riding Club is a documentary profile of one of the most colorful and accomplished female pilots of the early 20th Century. Florence ''Pancho'' Barnes became the first female stunt pilot in Hollywood in 1929 and shattered Amelia Earhart's air speed record in 1930. In the 1940's and 50's, Pancho entertained the best test pilots in the world men with the right stuff at her ''Happy Bottom Riding Club'' guest ranch near Edwards Air Force Base. When Chuck Yeager broke the sound barrier in the rocket-powered Bell X-1 in 1947, he and his team partied with Pancho. A friend of the fast and the famous, Pancho Barnes was a swaggering, forceful woman whose exploits and accomplishments are truly the stuff of legend. 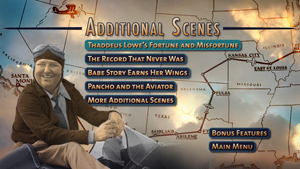 Featuring never-before-seen photographs and film footage and interviews with many of Pancho's friends including astronaut Buzz Aldrin and famed test pilots Bob Cardenas, Bob Hoover and Chuck Yeager The Legend of Pancho Barnes is an unforgettable, exciting, and poignant romp through aviation history. Narrated by Tom Skerritt, with Kathy Bates as the voice of Pancho Barnes. This deluxe DVD features both the broadcast (57 minute) and extended version (64 minute) of the documentary, along with nearly 18 minutes of additional video including deleted scenes. It also features an audio commentary from writer/producer Nick Spark and director Amanda Pope, a study guide for secondary school students prepared by the staff of the International Women's Air and Space Museum, and more. Please note, the extended version of the documentary contains some material that may be deemed inappropriate for younger viewers. Parental discretion is advised. Color and B&W. Presented in 16:9 widescreen and in surround sound. 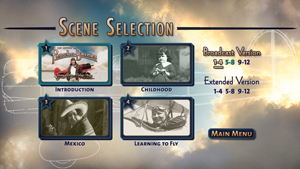 DVD box art, DVD menus, design and contents ©2009 Nick Spark Productions, Inc. All rights reserved. Director Amanda Pope is planning to attend and will be available to sign DVDs and posters. 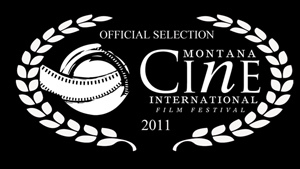 The Montana CINE International Film Festival features films on a broad range of topics and issues that lead to dialogue on critical and contemporary issues, and help to complete a global snapshot of our world. Now I have an actual, genuine, "scoop" to add to the Production .. Journal, and the most exciting news in Pancho-land since the film won the Emmy Award. It concerns the fate of Pancho's magnificent plane, the Travelair Mystery Ship. Read on. . .
Pancho Barnes' Travel Air "Mystery Ship" symbolized her bold, fast, wild life of adventure. It's a key part of her story and our documentary, and true to form an actual "mystery". The entire time we were making the film, I wondered where Pancho's plane had ended up. The last confirmed sighting of it was decades ago, when it was sold to an unnamed buyer. Combing through magazine articles and internet postings, and asking everyone we came into contact with, yielded few answers. A couple people seemed to know where it was, but said they "couldn't say" when pressed. Vows of secrecy, non-disclosure agreements, or just people having fun with us? One thing seemed clear: whoever owned it, really wanted to keep the plane's whereabouts a mystery. Pancho Wins an Emmy ! 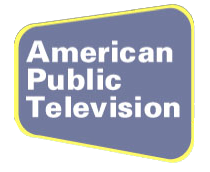 "Pancho" Receives an Emmy Award Nomination!